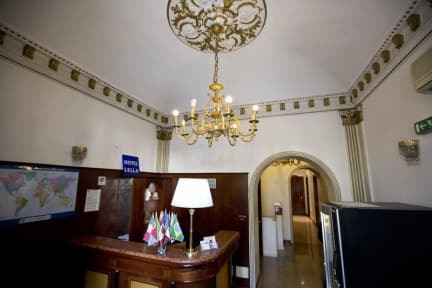 Nice, clean, cheap and secure place near Roma Termini. The hostel was more like a hotel. 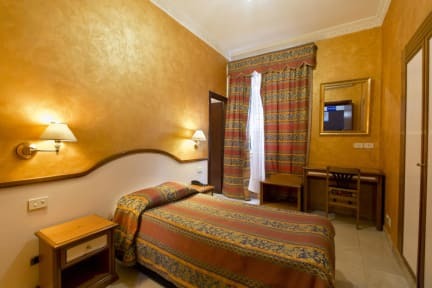 They offer single rooms for 1 person or double rooms for 2 people. Great for me and my partner because we wanted a private room for ourselves, and the private bathroom was much appreciated. The locations is not great for getting around the city, because it is far from any places of interest and most of the metro lines are over a mile and a half away. The room itself had a good AC unit and great windows for air circulation but you have to ask for the remote. Everything was ok, good location and friendly staff.Rooms were bit dark, but shower and toilet work fine. Good economic stay with good location, shops and restaurants just around the corner. The initial greeting by staff was a little awkward. The person manning the desk was disheveled and dirty. He acted a little strange as well. The room was a little old, but clean. The bathroom was especially clean. And the bed and pillows were really comfortable. It's not bad if you don't need all the amenities. A good place to lay your head, but not high on the wow factor. The bathroom was so mouldy and there were exposed wires in the room. Not a place I would chance with kids, or a compromised immune system. The whole stay is non-refundable from when you book. Site says they have wifi...... It does not work. My toilet didn't work, and the Wifi only worked in the lobby. The review says there is a laundry facility--there isn't. The lady that runs the place recommends you to a place a few streets down that's quite expensive. The room was falling apart around us--the crown molding fell from the door as a shut it. You have to turn in your door key every time you want to leave and ring the door every time you come in. It makes running to the grocery store a hassle. There was blood on my sheets & there were a bunch of creepy little incidents at this place.